The research that is carried out in our lab lies on the boundary between organic and inorganic chemistry. 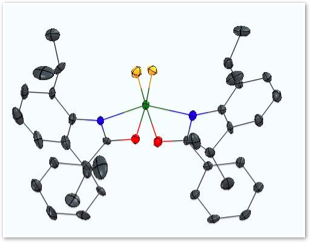 We are primarily interested in the development of new lanthanide and early metal based transition metal complexes that promote novel and desirable reactivity of organic molecules. In particular we have expertise in the atom-economic, catalytic synthesis of amines and N-containing heterocycles by either hydroamination or hydroaminoalkylation. In the long term we endeavour to save the world by applying our catalysts of low toxicity, which generate absolutely no by-products in the synthesis of these molecules that are critically important to the pharmaceutical and agrochemical industries. 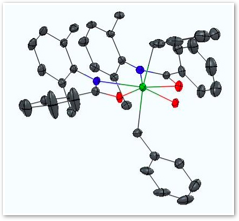 Since 2001 the Schafer group has been focused on the exploration of amidate complexes of the group 3, 4 & 5 metals, and thereactivity they promote. The auxiliary amidate ligand set was attractive to us as the organic amide proligands are easily synthesized in a single high-yielding step from inexpensive, commercially available starting materials. 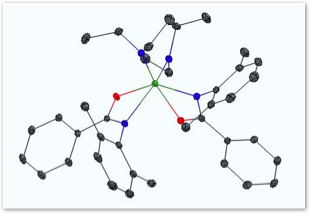 The modular nature of these ligands allows for easy steric and electronic tuning of the resultant metal complexes. Using commercially available metal starting materials and a simple protonolysis reaction, our metal complexes can be easily formed. Some crystal structures are shown below as representative examples of amido, chloro, alkyl, and imido complexes. Understanding fundamental reactivity trends, structure and bonding is a core component of our rather ''inorganic approach'' toward catalyst development. 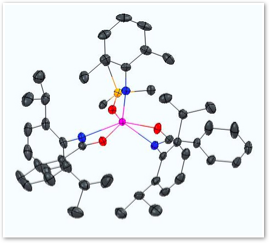 We are currently studying the catalytic and stoichiometric reactivity of our library of new amidate complexes. Some of these applications include alkyne, allene, and alkene hydroamination, tandem hydroamination/C-C coupling reactions, olefin polymerization, lactone polymerization, dinitrogen activation, C-H activation, and other atom-economic, catalytic reactions. 1. Hydroamination for the catalytic synthesis of amines and N-containing heterocycles. 2. Hydroaminoalkylation for the catalytic synthesis of amines and N-containing heterocycles. 3. Tandem-catalysis for the synthesis of biologically relevant N-containing compounds for medicinal application (in collaboration with industrial partners and life-scientists). 4. Ring-opening polymerization of lactones for the preparation of biodegradable polymers.